Nicole Paxton Sullo is a doctoral candidate in the History of Art department at Yale University, where she specializes in Byzantine and Medieval art. Her current work focuses on memory, temporality, and the development of these concepts in the textual and visual culture of Byzantium. 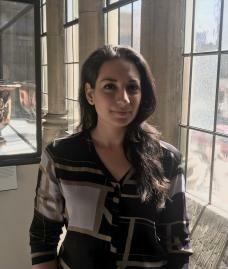 Her dissertation, “The Art of Memory in Byzantium during the Later Middle Ages,” examines the mnemonic function of sacred art, and considers how images engaged medieval viewers in programs of collective memory. By further taking into account contemporary texts addressing memory, recollection, and forgetting, this project reframes the study of art, its production, and reception in the later Byzantine milieu (c. 1204–1453). Other academic interests include the art of medieval Serbia, the play of word and image, cultural memory and exile, and dialogue on memory theories and techniques across the medieval Mediterranean.